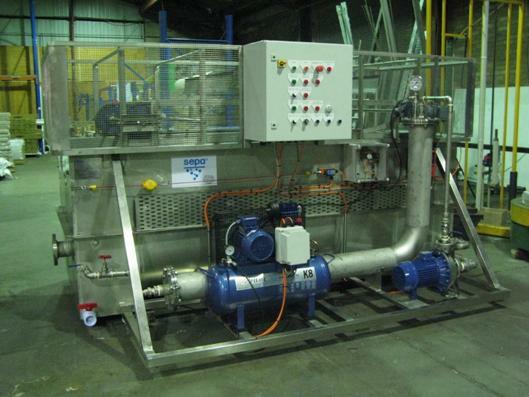 Depending on the application, flocculation addition may be required and inlet connection is provided for addition of dilute polymer to the dissolved air spin mixer inside the DAF itself. In addition, a coagulant such as PAC or Ferric Chloride may be used where emulsions or stable colloids may exists, or in the case of milk products, pH may need to be adjusted to allow precipitation of protein and butter fat. 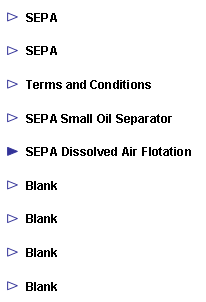 A complex example used for oil emulsion breaking is shown for interest. See the SEPA® waste water treatment plant as shown below. This has a Curved Bottom (Registered Design) for easy cleaning of sludge from the base of the tank. .